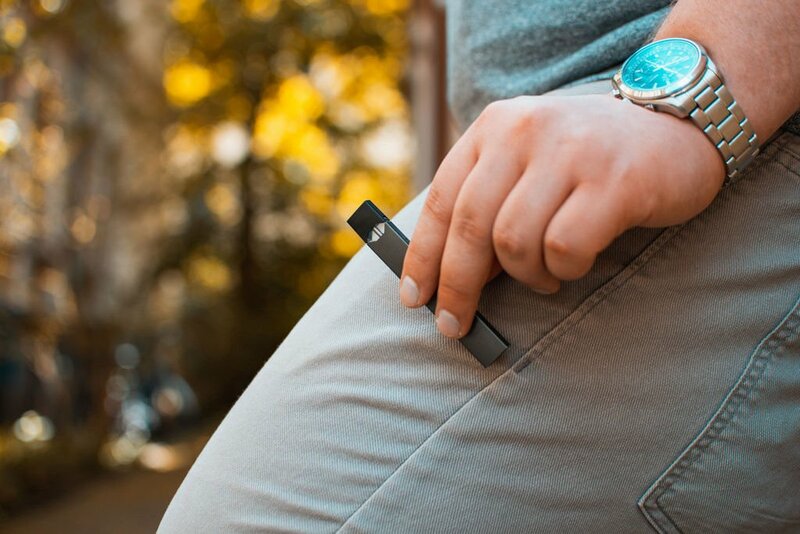 Although traditional cigarettes have been banned in most public places for over a decade, it is not uncommon to see someone using e-cigarettes, also known as vapes, in restaurants, public parks and grocery stores. Studies have shown that secondhand smoke — the smoke that comes from the burning end of a cigarette or that’s exhaled by a smoker — has negative health effects, and causes an estimated 41,000 deaths a year. But what do we know about the “vapor” that comes from e-cigarettes? Is it dangerous? The tobacco industry markets e-cigarettes as producing a “vapor” to make them seem cleaner and safer than they actually are. They want us to believe that what comes out of an e-cigarette is “harmless water vapor,” rather than aerosolized chemicals. Imagine you spray your hair with water. After a few minutes the water will evaporate, leaving nothing behind. This is an example of water vapor. Now imagine you spray hairspray on your hair. The hairspray will dry and leave a residue to shape and hold your hair. Hairspray is an aerosol, like the substance that comes out of an e-cigarette. Similar to the hairspray, e-cigarette aerosol leaves toxins and chemicals in your lungs. Children are particularly at risk of being effected by secondhand aerosol because their brains are still developing. Nicotine, the addictive substance found in cigarettes and e-cigarettes, has been proven to negatively affect an adolescent’s ability to focus, regulate moods and make sound decisions. There are still very few regulations regarding where people can vape, which puts all of us at risk for exposure to secondhand aerosol. Communities across the nation, including many in Colorado, are considering policies that limit e-cigarette use in indoor and outdoor public spaces. Regulations include amending the current Colorado Clean Indoor Air Act to restrict e-cigarette use in indoor spaces such as restaurants, workplaces and hotels, as well as implementing policies that restrict e-cigarette use in outdoor areas such as parks, community events and pedestrian areas. Learn more about e-cigarettes and vaping at tobaccofreeco.org.